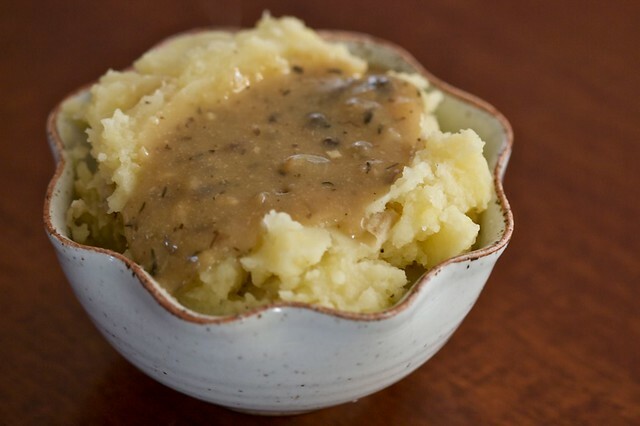 Mashed potatoes should be a no-brainer, but I’ve had some pretty bad vegan ones in my day. I think the problem has been three-fold: too much Earth Balance, the wrong kind of milk and over-boiling. Rule number one: always use unsweetened milk. Even regular soy milk or almond milk have a sweetener and that can give mashed potatoes an “off” taste. I prefer almond milk, but no matter you use, make sure it says “unsweetened” on the package. And yes, you can have too much vegan butter in your mash. I wildly prefer the taste and texture of olive oil. Also, never boil the potatoes. That makes the outsides mushy and kind of water logged. Instead, once the water is boiling, lower the heat to a simmer. Mash the potatoes once they are fork tender, if the potatoes are falling apart then they have been cooking for too long. But more important than anything is…the potatoes! Choose organic potatoes, because the taste of conventional potatoes just does not compare. And I love to use thin-skinned yukon gold. They’re so creamy and you don’t need to peel off the skin. Okay, now that I’ve chastised you, go off into the world and make these mashed potatoes for friends, family and even foes. Cut potatoes into about 1 1/2 inch chunks. Place in a pot and cover with cold water. Spinkle about a teaspoon of salt into the water. Cover and bring to a boil. Once boiling lower heat to a simmer and cook for about 12 minutes, until fork tender. Drain potatoes, then place back in the pot. Do a preliminary mash with a potato masher, just to get them broken up. Add milk, oil, salt and pepper and mash until fluffy. You may want to add a bit more milk, if needed. Taste for salt and pepper and serve! Better yet, steam the potatoes. They come out perfect this way. Cut the same and it takes about the same time (12-15 min). YUM! Can’t wait to try the gravy! I like to add some carmelized onions to my mashed potatoes. Put garlic and olive oil in an aluminum pouch bake until the garlic is golden and smooshy mash and add to M. Potatoes……I promise that they will be some of the best Ever! January 14, 2011 at 2:28 am: Nancy B. My MIL once told me her secret to mashed potatoes. After simmering them, drain the water out and let them sit for awhile in the pot to soak up any remaining moisture so they don’t get gummy when you mash them. That was for Russets, but maybe it works for Yukons as well. I add Nutmeg to my mashed potatoes. Garlic, thyme mashed potatoes with hemp milk and a little earth balance, salt and pepper are amazing as well! Great recipe! I added minced garlic (raw) and some thyme. Can’t wait to try the mushroom gravy. I made these tonight, delish! i love mashed potatoes! i find the best way to do them is to bake the potatoes in their skins, then coarsely chop and mash with the skins on. the flavour and texture are far superior! Can this be made with soy or flax milk for those of us with a nut allergy? Sure, just make sure it’s plain and unsweetened! I second the last question, can these be made the day before? Also, how about mashed sweet potatoes? Would you make them the same way, just use sweet potatoes? They can be made ahead. Sweet potatoes have a lot more water. What I usually do with sweet potatoes is simply bake until very soft, scoop from the skins and mash with some cinnamon. They don’t even need any oil or additional liquid. Wonderful… Making them again tonight with more of that lovely gravy. Wow, you just saved me from making mashed potatoes that were sweet! I didn’t know almond milk was sweetened. Thanks – these were yummy! exactly the answer I was looking for :) thank you so much! Using a nut oil will add a different dimension to the potatoes. Like a hazelnut or walnut…or maybe even a truffle oil. I tweaked this just a bit to meet our needs (my mom’s vegetarian, not vegan) and they turned out delicious! I replaced the soy milk with skim milk and the olive oil with grapeseed oil. I also added some garlic powder and dry chopped onions. Best mashed potatoes ever! If I wanted to add some garlic to it, how much would you suggest so that it wouldn’t be overkill? I’m definitely a cook-in-training and I haven’t had much luck with certain soup and pasta recipes, for whatever reason. So any help is VERY MUCH appreciated. Thank you. This is a wonderful recipe! Due to my sister’s and my allergies, we had to use coconut milk. Thankfully this wasn’t a setback at all! The potatoes came out very creamy and fluffy, just as advertised :u) Thanks so much! I didn’t read this before I bought regular almond milk :( I get what you’re saying about the sweetness thing. You know what solved the issue? Deli mustard! It’s yummy. Wonderful recipe! I made 5 portions the day I arrived…after that perhaps I need to sleep in a coma of carbohydrates hehehe. I will need a day to recover. It wasn’t enough food for all my friends, so I will make 6 portions this time instead. I made this recipe with soymilk instead, for the protein, and added some fresh herbs from my garden to spice it up a little. My son asked me to make mashed potatoes for his school’s Harvest Fest tomorrow. I’m following the recipe as is. I’m mashing and and tasting as I go. I’d normally would have used the Earth Balance. It’s wonderful with the EVOO — I like the EVOO more. So delish!